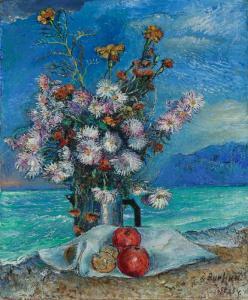 Find artworks, auction results, sale prices and pictures of David Davidovich Burljuk at auctions worldwide. David Davidovich Burliuk (Ukrainian/American, 1882-1967), "A Quiet Evening - Florida", oil on canvas board, signed and titled lower right, 9 in. 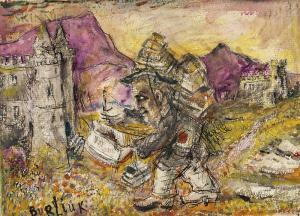 x 12 in., framed; together with copy of letter of authentication from The Burliuk Foundation, BF identification number OP00142. (2 pcs.) Note: David Davidovich Burliuk was born into a wealthy Ukrainian family and received art training in Odessa, Munich, Paris and Moscow. Eventually expelled from the Moscow School of Painting for embracing Futurism, he is now considered one of Russia\’s most important Avant-Garde artists. His early influences were Fauvism, Cubism, Futurism and ancient Scythian design elements, all with an emphasis on boldness of color. After the Revolution of 1917, he immigrated to the United States in 1922. The change in countries also resulted in a change in his artistic style. Burliuk began to focus on landscapes painted in what he termed \“Radio Style,\” blending symbolism, neo-primitivism and expressionism with his love of color, strong texture and spontaneity. Many of these works focus on people living a simple existence in an almost pre-industrial world, achieving a soft quietness despite his use of impasto and vivid color. 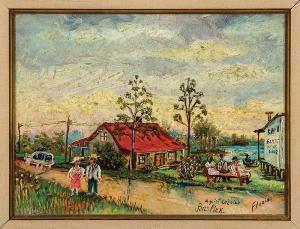 Active in Florida both before and after World War II, Burliuk worked with the Maitland Art Center, founded by fellow artist Jules Andre Smith. Ref. : \“Futurism and After\”. Ukrainian Museum of Art. www.ukranianmuseum.org. Accessed Mar. 11, 2019; Libby, Gary R. Reflections: Paintings of Florida. Daytona Beach, FL: The Museum of Arts and Sciences, 2009. 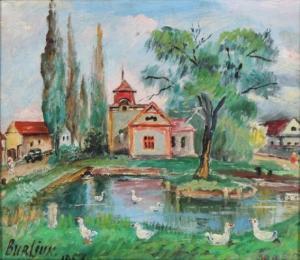 Description: David Davidovich Burliuk (Ukrainian/American, 1882-1967) Itinerant Artist in a Castle Landscape Signed "BURLIUK" l.l. Ink and watercolor on paper, 11 3/8 x 16 in. (29.0 x 40.5 cm), framed. Condition: Soiling to the edges of the sheet, minor rippling, hinged to window mat with brown paper tape along the center top edge of the reverse, remnants of former hinges at intervals along the edges of the reverse. 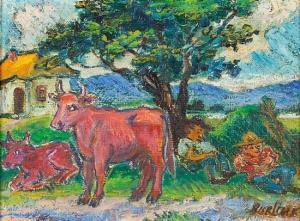 Sale 172 Lot 52 **David Davidovich Burliuk 1882-1967 (Ukrainian, American) Quiet afternoon oil on board h:21 w:27 cm. signed lower right Provenance: A.C.A. Gallery, New York (label on the reverse, dated '26.08.1955'). Private collection, Southern Pines, North Carolina. Private collection, Apex, North Carolina. Private European collection. Other Notes: Location: Israel. For estimated delivery time please contact us. Condition report available upon request.